Download the app and use it to explore the walks and to purchase a guided route. The app guides you around the walk using GPS, removing any worries about getting lost. Detailed, well-tested directions are also included which follow you as you walk. Once a walk is downloaded, the app doesn't need a phone or wifi signal during the walk. We keep the directions continually updated for changes to the paths/landmarks - £1.99 for a walk includes ongoing free updates. Many of the churches in Cornwall are on sites that date back to Celtic times and many churchyards contain mediaeval Celtic crosses. Sacred springs are also quite common, which predate Christianity in Cornwall, from a time when natural wonders were worshipped and these were seen as gateways into another world of fairies and magic. A circular walk on the Towans at Hayle where Cornwall's beam engines were cast using sand from a prehistoric lagoon when West Penwith was an island. A circular walk along country lanes, tracks and through fields to Penfound Manor - thought to be the oldest continually-inhabited ancestral home in England - from Poundstock church and gildhouse - the only surviving mediaeval church house of its kind in Cornwall. A short circular walk from the village of Blisland through the churchyard, two stretches of the Woodland Trust reserve of Lavethan Wood and land which was once the estates of Lavethan and Barlandew manors, returning via the Holy Well of St Hyacinth and St Pratt. A short circular walk in the tributary valleys of the River Valency through bluebell woodland beside a stream, and across meadows rich in wildflowers to the ancient Celtic churchyard of Lesnewth. A circular countryside walk from the 15th century church at St Tudy through the grounds of the 18th century Manor of Wetherham, returning to the church alehouse where ale brewed by the church was sold to raise funds, and later became the village lock-up known as The Clink. A circular walk to the Beacon Local Nature Reserve, Jail and through Bodmin's historic centre. A fairly short and easy circular walk around Warbstow, crossing ramparts of the massive Iron Age hillfort, through fields and along country lanes lined with wildflowers, returning via the mediaeval church which is dedicated to the daughter of a Saxon King who was tutored by the Celtic Saint Morwenna. A circular walk from the Saxon village of Week St Mary through Ashbury woods, beneath the Iron Age fort, to the remains of the mediaeval manor of Penhallam which was only rediscovered in the 1960s, returning via the church, repaired after the pinnacle above the door was severed by lightning and crashed through the roof. A circular walk on quarrymens' trails along cliffs of Tintagel past the Thunderhole blowhole to the long, sandy beach at Trebarwith Strand from Tintagel's mediaeval clifftop church with relics including the font that once stood in Tintagel Castle's chapel. A circular countryside walk around the Saxon area of Jacobstow near Bude where an ancient mediaeval altar was removed from the church during the 16th Century and used as a footbridge over a stream, then used as a churchyard seat in Victorian times, and finally returned to the church in the 1970s. A circular walk from St Issey along the river valley, the Saint's Way to the creek-side church at Little Petherick, and along the creek to the tidal enclosure of Sea Mills, returning via two old inns. A fairly easy circular walk from St Mabyn past the church and inn and through rolling countryside to Pencarrow House and its magnificent gardens. A circular walk from Mawgan Porth along the Vale of Lanherne, following the river Menalhyl to St Mawgan and returning past the 800-year-old cloistered Convent where the sanctuary light has been burning for hundreds of years. A circular walk from Mylor along the creeks of Carrick Roads to Flushing which was named after a town in Holland when Dutch engineers built the quays, and where ships' captains would keep a watchful eye over Falmouth Harbour from their tall houses. A circular walk on the northern edge of Bodmin Moor through the WW2 airbase on Davidstow Moor, the tunnel of trees to Treworra and past the source of the River Inny to the Church and Holy Well of St David. 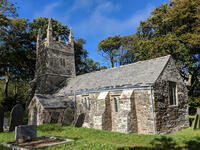 A circular walk around the creeks of the Helford River and the small villages settled by Celtic monks from Brittany. A circular walk from Camelford through bluebell woods along the Camel valley to the Celtic churchyard of Advent and the Neolithic remains on the edge of Bodmin Moor. A circular countryside walk to the mills in the Inny Valley from Polyphant, Cornish for "toad pool", to Gimblett's Mill where the bridge was rebuilt after a wall of water swept down the valley in 1847 destroying nearly everything in its path. A circular walk passing the National Trust's Glendurgan gardens and the equally spectacular submarine gardens of Rosemullion Head where fish dart amongst the brightly-coloured blooms. A short circular walk from Boscastle through bluebell woodland alongside the River Valency to the ancient Celtic churchyard and sacred spring at Minster, returning along the River Jordan, beside which Bottreaux Castle was once situated, and Boscastle's Old Road. A circular walk from Lansallos to the coves of Lantivet Bay where farmers collected seaweed and sand to improve the soil and smugglers landed French brandy. A short circular walk from St Breward through ancient bluebell woods along the valley of the River Camel to the holy well, ending at the mediaeval church and inn. A circular walk from St Erth along the River Hayle, lined with wildflowers in the spring and summer, and returning with views over the Hayle valley which was once a lagoon separating an island of West Penwith from the Cornish mainland. A circular walk from Boscastle to Pentargon waterfall and Willapark coastguard lookout with magnificent views of the village and harbour from the headlands where the village women once gathered dressed in red to fool a French ship into fleeing from British army redcoats. A circular walk in the Ruthern and Tremore river valleys following the Saint's Way to Withiel where the award-winning cheese Cornish Yarg was first made from a recipe in a dusty book found in the attic, that is thought to date back to the 13th Century. A short circular walk from Padstow harbour to the viewpoints at the War Memorial and Victorian obelisk, the Elizabethan Manor at Prideaux Place, and including some pretty back streets that lie off the main tourist routes. A circular walk along prehistoric trade routes in the Lynher valley from the village of North Hill where the granite was quarried to build Westminster Bridge. A figure-of-8 walk from St Endellion to Port Isaac, via the estate of the ancient family of Roscarrock, who survived torture on the rack during Tudor times for being Catholic sympathisers, returning to the parish church, dedicated to the daughter of a Celtic king, on the ancient route which itself influenced the fervent adoption of Methodism in Port Isaac. A circular walk along both sides of St Just creek to Messack Point where there are spectacular views over one of the largest natural harbours in the world. A circular walk on the Roseland coast where, during the Napoleonic Wars, smugglers would row out to the middle of The Channel in pilot gigs to trade with the enemy. A circular countryside walk from the Saxon village of Warbstow to the Celtic hamlet of Treneglos in the tributary valleys of the River Ottery, where the North Cornwall railway once ran. A circular walk from St Ives through the Steeple Woods nature reserve to the monument overlooking St Ives Bay where the eccentric quinquennial ceremony of John Knill has been performed for over 200 years, returning along the coast via the white sandy beaches of Carbis Bay and Porthminster. A circular walk through two tributary valleys of the River Tamar in a parish that was borrowed by Devon for 800 years, passing the remains of the wharf at the furthest reaches of the Bude Canal. A circular walk in the tributary valleys of Cardinham Water to the remains of the Bury Castle hill fort where the ramparts are still over 14ft high even after more than 2000 years. A circular walk at St Ives along the granite coastline and white sandy beaches which have inspired so many artists, through some of the most famous parts of the town including the harbour, The Island and The Tate, and via the church and holy well of Celtic girl Ia who, according to legend, was the first to settle here. A walk to the Victorian harbour of Mullion Cove via two sandy coves either side of where Marconi made history by achieving what was thought impossible by many of the scientific community at the time - the transmission of a radio signal all the way across the Atlantic. A figure-of-eight walk from Readymoney Cove past the Tudor fort and along the coast where Daphne Du Maurier lived to Polridmouth where the shipwreck inspired the end of her book Rebecca, and then along the mediaeval streets of Fowey. A circular walk in the Fal valley from Grampound which began as river port in Roman times which evolved into the gateway into West Cornwall in mediaeval times and went on to become the centre of Cornwall's tanning industry. A circular walk from the woodland of The Duchy to the Holy Well of St Ladock in the river valley where in 1802 a gold nugget was found that contained enough gold to make an elegant necklace which is now in Truro museum. A circular walk in the upper reaches of the River Valency above Boscastle, where author Thomas Hardy lived and met the love of his life, starting from the ancient Celtic church of Lesnewth to St Juliot church which Hardy restored. A circular walk through the horticulturally-famous Trewithen Gardens from Grampound via the hamlet of Golden where the sundial and ornate windows of a farmyard barn give away that it was once a mediaeval manor prior to the Tudor monarchy confiscating the estate for harbouring a Catholic priest. A circular walk to the creekside church of St Winnow along the River Fowey and Lerryn where hoards of Roman coins have been found on the river banks, and overlooked by the manor house that is thought may have been the inspiration for Toad Hall in The Wind in the Willows. A circular walk from Poley's Bridge along the Camel Trail past the old china clay driers to Wenfordbridge and crossing the De Lank valley and Pendrift Downs to Blisland, returning over the mediaeval river crossing at Keybridge. A circular walk from Pendower Beach to Veryan via Nare Head where, in Victorian times, an unhappily married fisherman lived alone the in cliff-edge cottage, lowering his boat on a rope over the cliff and returning once a week to Veryan to bring his wife fish. A circular walk through the wildlife reserve around the reservoir lake, past crumbling ruins of Fir Hill Manor and via farmland, a mill and wooded vales that were also once part of the great estate. A circular walk from the Loe Bar to Dollar Cove passing the wrecks of treasure ships whose cargo still washes ashore, returning via the Halzephron Inn which still has a trapdoor leading to an underground network of tunnels used by smugglers. A circular walk via the Victorian obelisk overlooking Padstow, the creek-side church at Little Petherick and the tidal enclosure of Sea Mills, returning via the Camel Trail bridge which carried the railway that brought the first Victorian tourists to Padstow and Cornish fish to London. A walk on the tracks trodden by the donkeys laden with slate from the coastal quarries of Trebarwith to Tintagel Haven where the slate was loaded onto ships and Tintagel Castle's island, inhabited during the mediaeval period, the Celtic times of King Arthur, and before this by the Romans. A circular walk in the river valleys around St Kew - the first recorded village in Cornwall, passing the mediaeval church containing a grave stone from the Dark Ages carved in Latin and the Celtic script, Ogham, also known as the Tree Alphabet as each letter symbolised a different species of tree. A figure-of-8 walk from St Clether past the ancient chapel and holy well, with views over the Inny Valley, to the Rising Sun pub near Altarnun, serving beer made from the moorland springwater by a local micro-brewery. A circular walk from Helland's mediaeval bridge through bluebell woodland and the fields overlooked by the Iron Age rounds at Pencarrow to the Norman church at St Mabyn, dedicated to the daughter of a Celtic King, and returning via the stump of the Neolithic Long Stone which stood for millennia until it was broken up for gateposts in 1850. A circular walk from Gorran Haven to Portmellon via the sheer cliffs from which Henry Bodrugan leapt to escape execution and sheltered Colona Beach, returning through West Bodrugan Woods Nature Reserve and via Gorran church which now has some of the finest bells in the country. A circular walk on the Roseland peninsula to St Mawes from the subtropical gardens of St Just church, along Carrick Roads where Europe's only fishery entirely under sail catch oysters using the traditional methods that have sustained their stocks. A circular walk from St Wenn in the upper reaches of the Ruthern Valley, through Rosenannon woods and along the Saints' Way pilgrimage route to the mediaeval church at Withiel, where the Rector shut down The Pig and Whistle for being an ungodly establishment. A circular walk from Boscastle along the dramatic coastline of islands and arches towards Tintagel, following the cascading river up Rocky Valley past the ruined mills and labyrinthine carvings and returning via the mediaeval churches of Trethevy, Trevalga and Forrabury. A circular walk passing the sandy beach at Polurrian Cove, the storm-beaten Victorian harbour at Mullion Cove, and along the cliffs of the National Nature Reserve overlooking Mullion Island, with vibrant wildflowers in spring and summer. A circular walk from St Breward past the granite pillars of Devil's Jump to the 8ft Celtic cross and ancient churchyard of Advent at the foot of the moors, returning via the remains of the mediaeval village of Carwether to the Inn used by 11th century monks to build the highest church in Cornwall. A circular walk from St Ives on the ancient churchway towards Zennor and returning along the rugged coast to Porthmeor where a Victorian cargo ship and the St Ives lifeboat were both wrecked and the ship's boilers are still visible at low tide. A circular walk between the beaches in Falmouth Bay and where one of the most dangerous marine rescues of modern times took place, requiring the rescue helicopter to fly backwards. A circular walk to Padstow from Trevone beach, which tracks the route taken by sailing ships along the rugged Atlantic coast to the daymark at Stepper Point, past the infamous Doom Bar and the sandbanks of Hawker's, Harbour and St George's coves before finally reaching safe harbour in Padstow. A circular walk via some of the mediaeval farmsteads on the west of The Lizard to the ancient churchyard of Cury from the coves of Mullion and Gunwalloe where the wrecks of treasure ships still lie. A short circular walk at Morwenstow to the cliff edge hut built from driftwood in which Reverend Hawker smoked opium and composed poetry, returning along the river valley to the ancient Bush Inn where medieval monks would rest the night before continuing their pilgrimage. A circular walk from the surf beach at Crackington Haven to the mediaeval church at St Genny's via the imposing Penkenna Point, where there are spectacular views of the bay and the secluded landing points used by some of North Cornwall's most notorious smugglers and wreckers. A circular walk to the beach and tiny harbour of Portwrinkle from the small village of Sheviock, thought to be Cornish for "abounding in strawberries", with a church abounding in mediaeval tombs. A circular walk from Blisland through the De Lank granite quarry, used for many famous buildings including Royal Opera House, between the moss-covered boulders and trees of the De Lank river valley and across the Pendrift Downs, passing Jubilee Rock - a huge granite boulder, decorated with carvings. A circular walk above the white sand crescent of Lantic Bay and the small coves of Lantivet Bay where a battle was once fought between smugglers and Customs men, and following an ancient cart track along the stream through the woods to the mediaeval church of Lansallos. A circular walk from Lerryn, along wooded creeks and across fields, to the church of St Veep which is the only one in England where the bells were cast in perfect tune. A circular walk from St Neot though the valley of the River Loveny, past a prehistoric settlement, through bluebell woodland and along the River Fowey, and returning via the church, famous for its mediaeval stained glass. A circular walk around the valleys of the River Inny and Penpont Water to the mediaeval church at Laneast and the old bridge at Gimlett's Mill from the 15th century "Cathedral of the Moors" in Altarnun, set beside a 6th Century Celtic cross where churches and chapels had been throughout the Dark Ages. A circular walk along the coast from Talland Bay to Looe, passing the pilgrimage site of Looe Island which Jesus was said to have visited as a child, and returning via the ancient Giant's Hedge in Kilminorth Wood and Talland's mediaeval church. A circular walk at St Gennys from the mediaeval church, via the smuggling routes though bluebell woods along the stream and an Iron Age clifftop fort crumbling into the sea, to some of North Cornwall's most remote coastline. A circular walk from the sandy beach at Porthpean, past the brilliant white shingle beaches at Silvermine to the Iron Age fort on Black Head, returning via the site of an Iron Age metal works with spectacular views over St Austell Bay. Download the iWalk Cornwall app and use the QR scanner within the app to find out more about any of the walks above.